We are so excited to be sharing two fun and unique Mini Christmas Trees that each reflect the parts of the country that we call home! 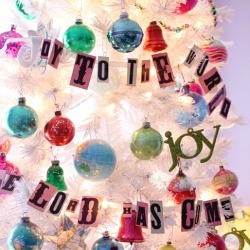 Join us, along with several talented bloggers on a cross-country Christmas Tree hop! Up first we are visiting Vanessa in the Pacific Northwest…. As soon as we started brainstorming ideas for our Christmas Trees I knew I wanted to pay homage to my beautiful Willamette Valley. Many don’t know that the Pacific NW, where I am privileged to live, is home to some of the most fabulous wineries in the country….dare I say world? And, I dared to decorate a Christmas Tree that I feel represents the beauty of this area. 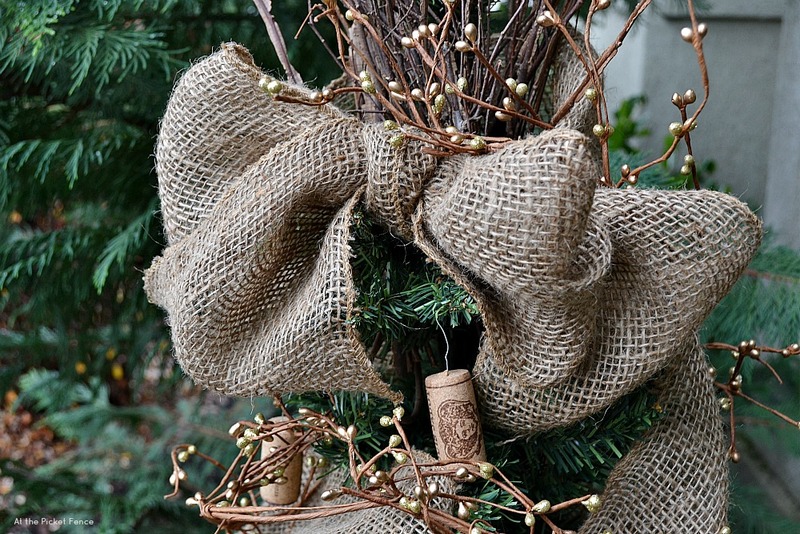 In keeping with a more natural look, a bow of burlap ribbon at the top then winds it’s way around the tree to add softness and texture. Grapevine branches make the perfect tree topper to honor wine country. 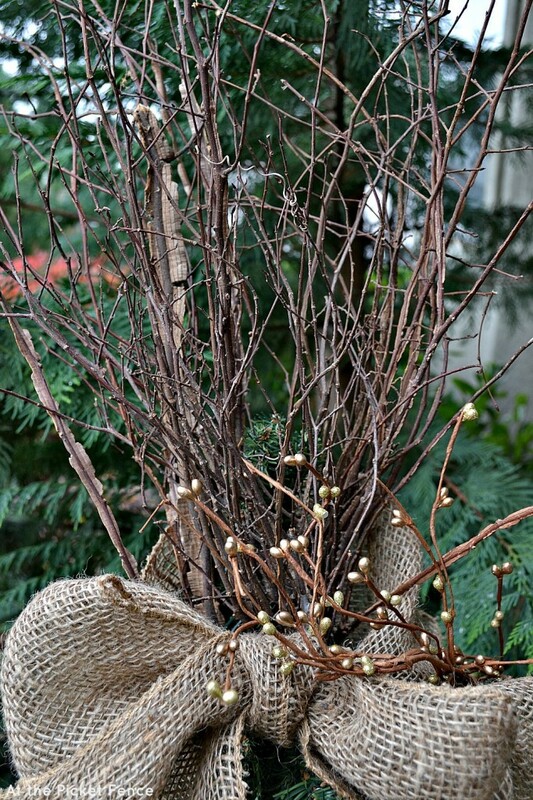 Twiggy garland with small gold berries add just the right pop of color and reflection almost making the tree look as though it’s lit up. 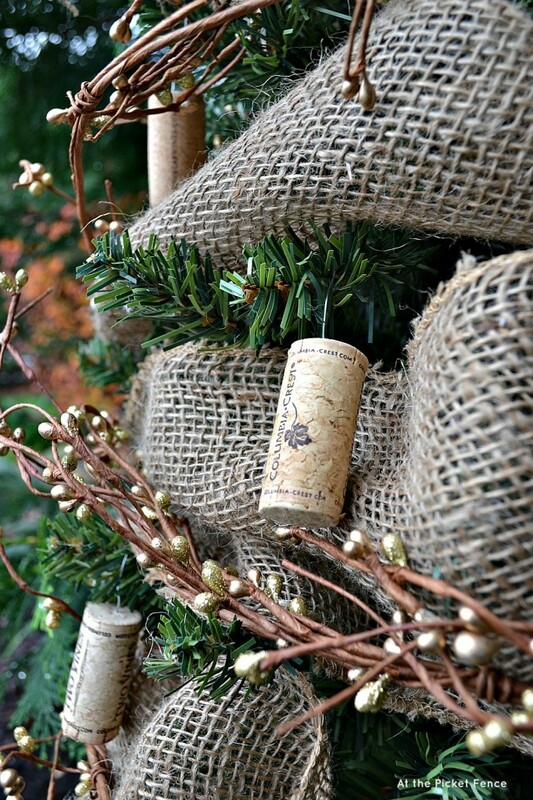 Wine cork ornaments are so easy to make! Almost so easy I’m embarrassed to explain it…but I will…cause this is a blog and that’s what we’re supposed to do right? 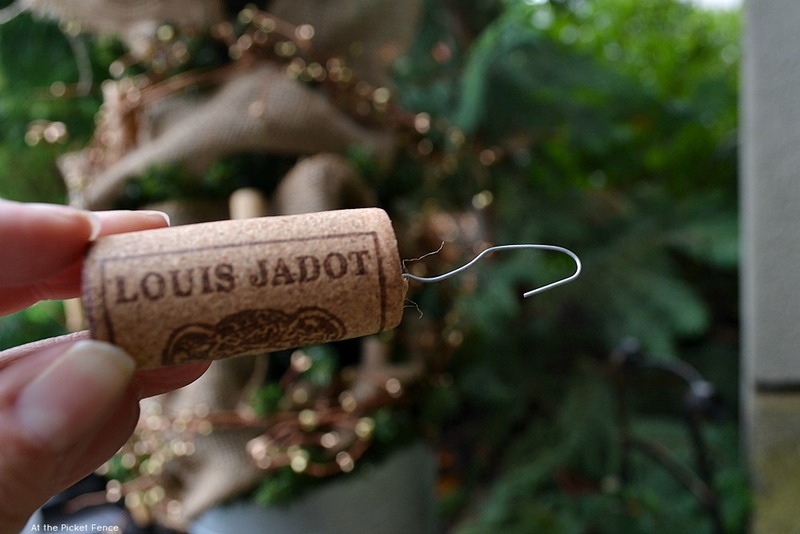 Either use corks you already have or buy some at your local craft store. Open up one end of an ornament hook and stick it into the middle of the cork. See, told you I didn’t really need to explain it! 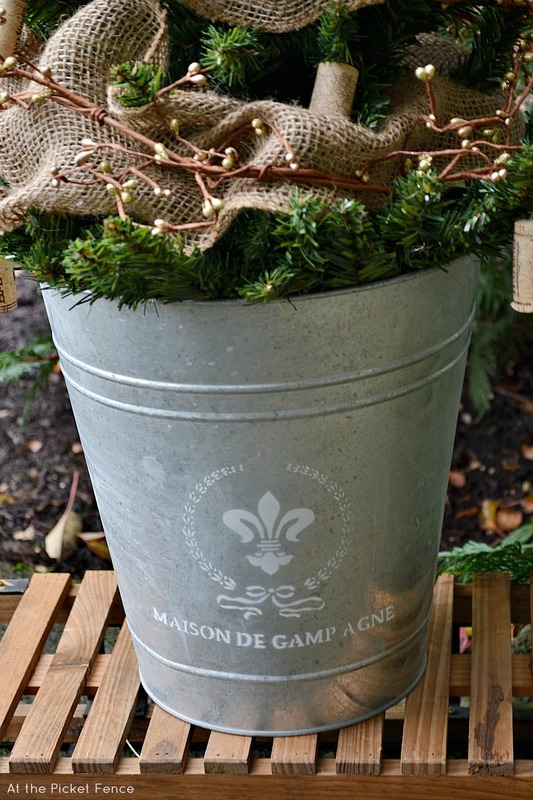 A galvanized bucket becomes the perfect Wine Country Christmas Tree stand. And my tribute to the Willamette Valley Wine Country is complete! This weekend we’ll be heading up into the mountains to cut down our fresh Christmas Tree and I can’t wait to get it decorated and share it with all of you! Onto Heather’s home in the Bluegrass State…. Welcome to my country kitchen in the hills of Kentucky! 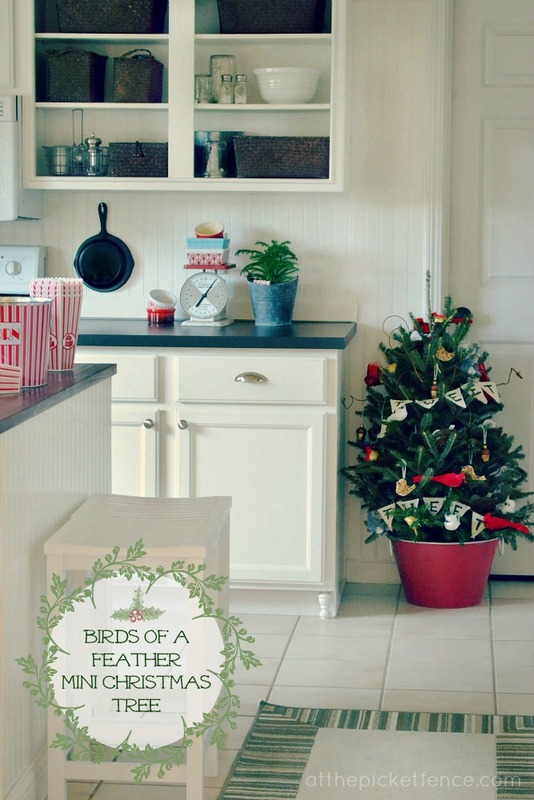 I’ve always wanted to have a “kitchen tree” and I thought what would be more appropriate than a nod to nature with a “birds of a feather” themed tree! Of course it wouldn’t be a nature tree unless it was a fresh tree. 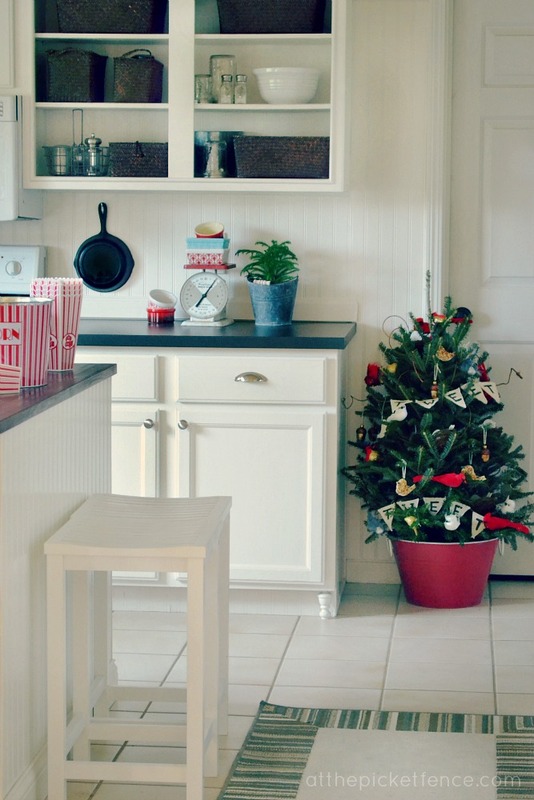 I found this darling little pine, the perfect size for the corner of my kitchen. I created this simple little canvas pendant banner with pre-cut pendants from Hobby Lobby and wired twine. 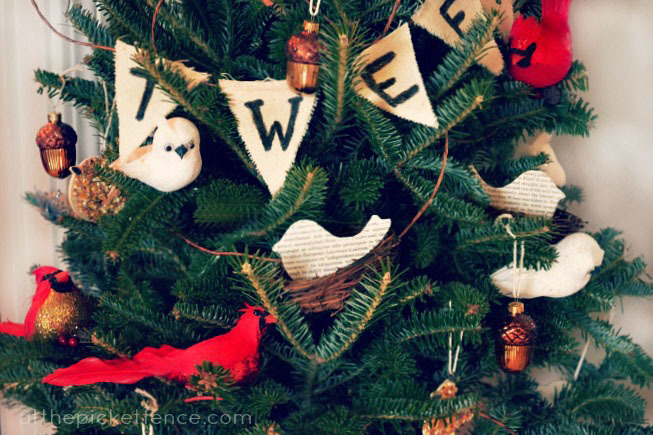 I hot glued the pendants onto the twine and wrote out the words “tweet tweet.” That’s the way birds say “Merry Christmas” after all. smile! In addition to the metallic acorns and various feathered friends I’ve picked up over the years, I also mode these book page birds that seem quite at home in their little nests. I picked up little wooden bird cut-outs for .29 each at Michael’s and after tracing out their shape onto book pages mod podged them and hot glued them into tiny nests. 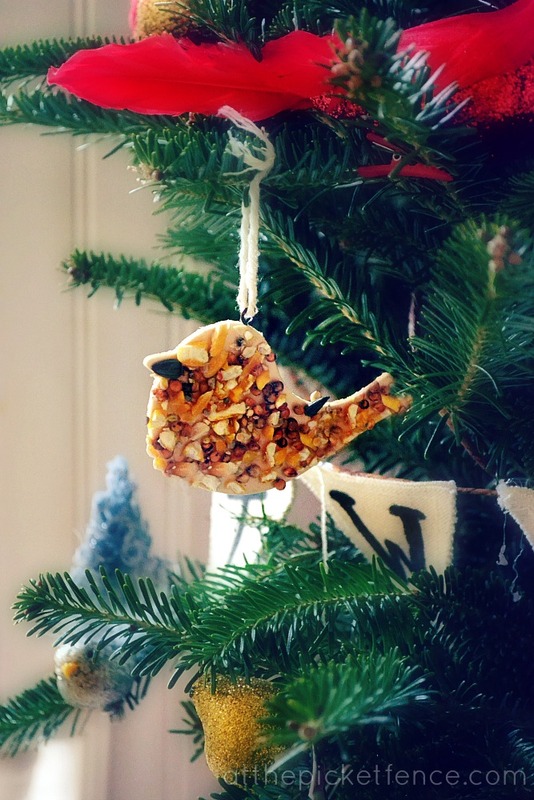 Of course it wouldn’t be a bird themed tree without a little birdseed! Using the same cut-outs as I used for the book page birds, I applied a thin layer of glue and lightly pressed them down into birdseed. The sunflower seeds made perfect little beaks! I adore how this tree turned out. It’s a bright and cheery spot in my white kitchen and makes me happy every time I’m in there, which is often during the holidays! The fresh pine smells wonderful and my sweet little birds are there to keep me company during hours of baking and cooking. 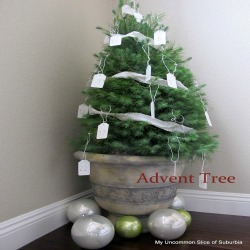 Have you seen the other fabulous trees that our friends are sharing today! 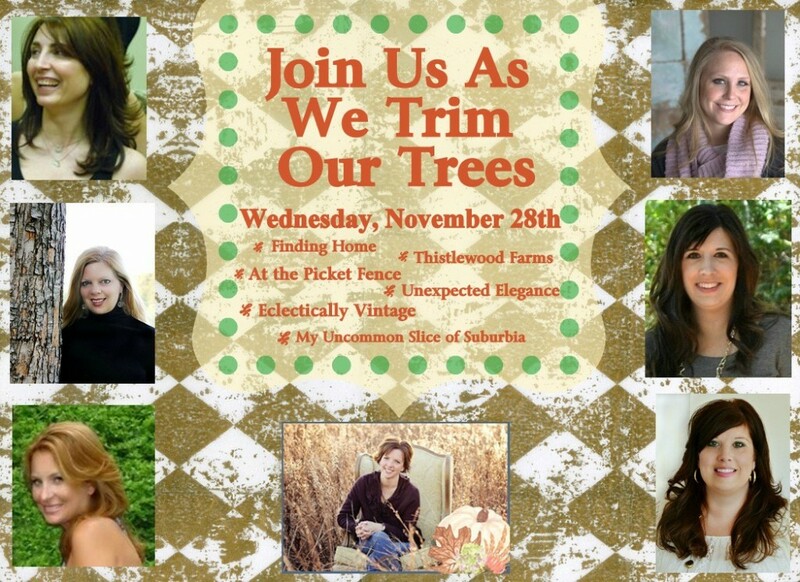 Be sure to visit Angela from Unexpected Elegance, the hostess with the mostess of this fun Christmas Tree Hop, KariAnne of Thistlewood Farm, Kristin of My Uncommon Slice of Suburbia, Laura of Finding Home and Kelly of Eclectically Vintage!They are each sharing their gorgeous themed trees with you as well! As always we love having you here with us, where the Christmas season is in full force…and we’ll see you tomorrow afternoon for Inspiration Friday, with some fabulous features! 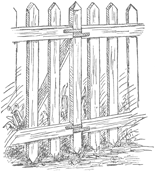 Thank you for joining us today…at the picket fence! 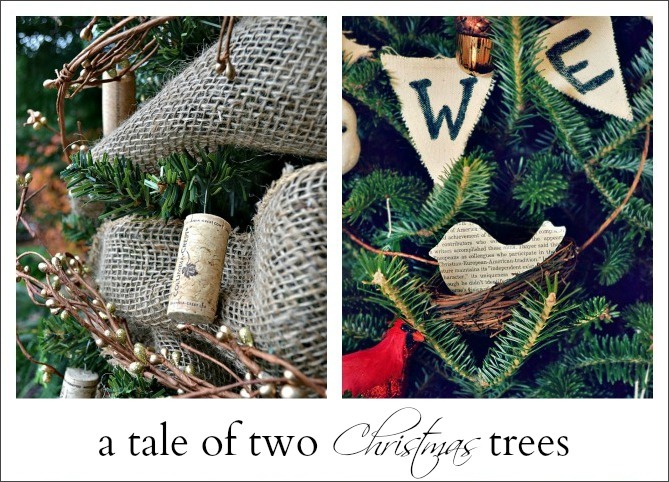 34 Comments on "A Tale of Two Trees..Christmas Tree Blog Hop"
Great idea! it’s fun seeing a variety of tree ideas! Love them! I absolutely love both of them – alike in size and location – but totally different in execution. 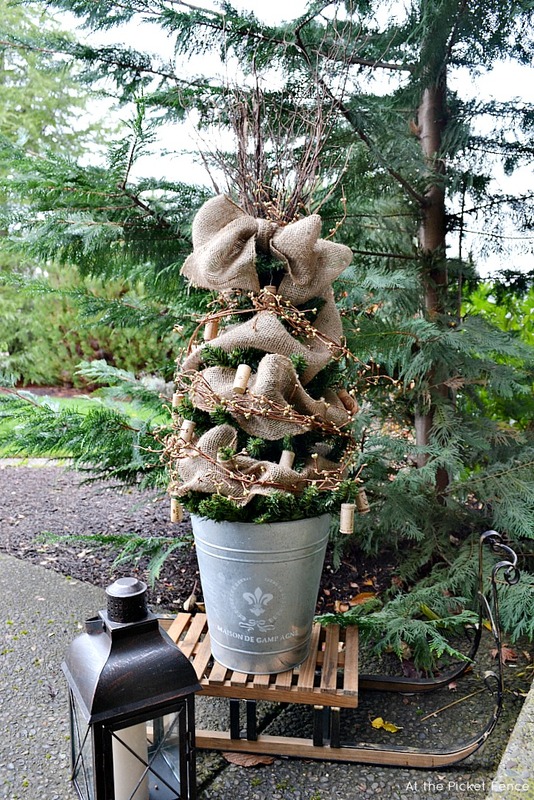 The burlap bows, the little bird seed bird ornaments! And anything with cardinals makes me think of my Grandfather – so I love it even more! Both trees are so pretty, ladies! I’d love to do something with all the wine corks I’ve been saving. Both trees are so very sweet! Love! These two trees are beautiful. Love the different elements you used. Love the tree’s girls, so pretty! So happy to kicking off this party with you! Both of your trees are beautiful and wonderful and incredible (just like both of you)….but can we discuss the photography…..seriously. Have a blessed and wonderful day my friends! Pretty trees! 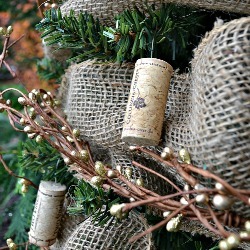 Love the wine corks so cute!What a cool idea with that ball jar too! 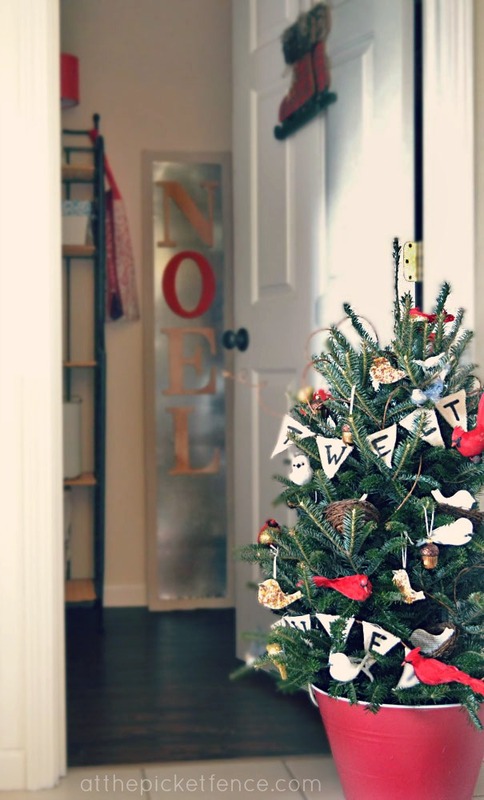 These are both gorgeous trees, but I am in love with Vanessa’s tree with the wine cork ornaments and grapevines–lovely! Both of your trees are so cute. I love how they are in unexpected places in your homes. WOW – no wonder you girls are sisters! You both knocked it out of the North Pole with a giant snowball! Of course, anything wine related makes me go all weak in the knees so I can really appreciate Vanessa’s gorgeous homage to wine country (get that guest bedroom ready for me)! 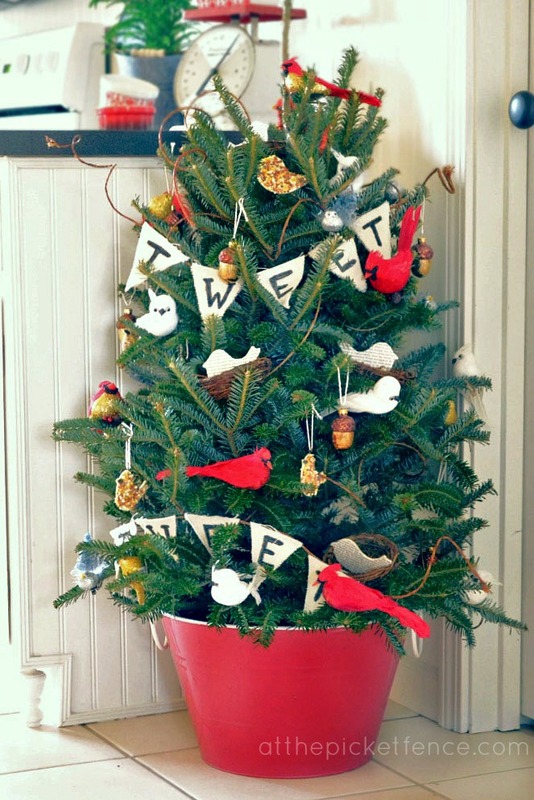 I am in LOVE with that tweet little tree Heather! 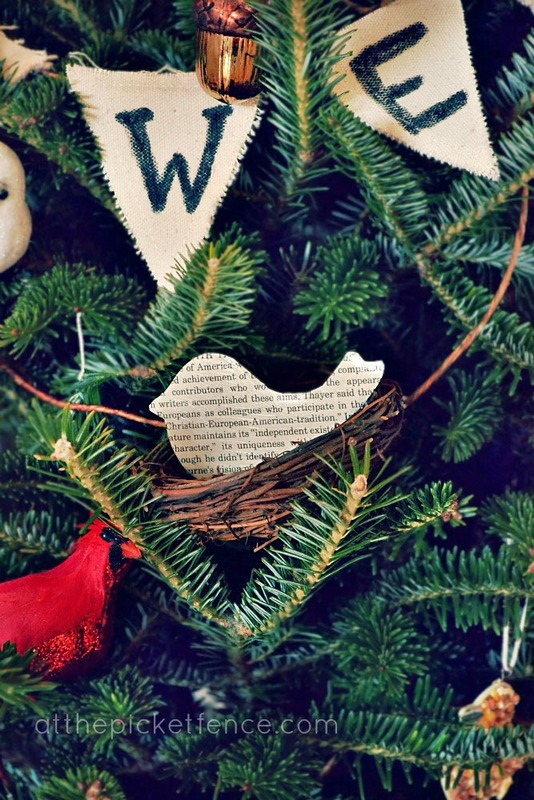 Those birdseed ornaments are the cutest – what a fun idea! Glad to be hopping around the Christmas trees with you both! I love both of y’all’s trees. Cute themes for both. Heather & Vanessa – Both trees are just great!! You both did a fantastic job!! What a nice feature you have here Heather and Vanessa; I love the wine country Christmas tree. Girls, you outdid yourselves! Heather, I love the tie in to the scripture. Love both your trees! 🙂 Beautiful! I love your mini trees and how they express where you both live. We were joking last night that maybe that’s the size tree we should put up this year – period. Lol We are putting up our tree this weekend. Last night started the other decorating. 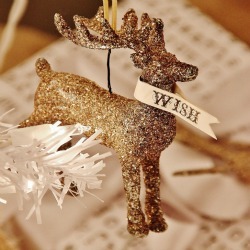 I love seeing how everyone decorates their trees. I think they are BOTH adorable. 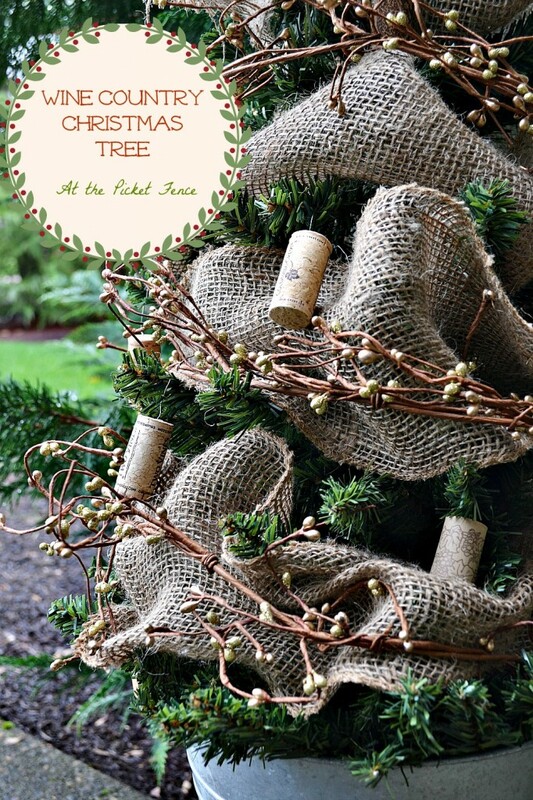 I would never have thought of the corks, but what a wonderful idea! I actually do have a little bird themed tree in my powder room. It needs a facelift because I’ve just been doing the same stuff year after year. THANKS Heather, for some wonderful ideas to amp it up. And next year, Heather will have to do a land o’cotton tree. Girls…they are both adorable! Looking forward to seeing more trees! Both of these trees are adorable! I would love to try this next year! Thank you for joining HSH! read this piece of writing i thought i could also make comment due to this sensible post.